It is becoming clear that our main focus this trip seems to be the Ferocacti that we pass on the way south. Jonathan has learned that it is better to read Nigel Taylor’s paper published in Bradleya (1984) in the hotel rather than as we speed past a myriad of cacti. He’s happy that we have seen F. gracilis in its various forms but what happened to F. fordii? Angie and I concentrate on spotting the Feros and taking their pictures, happy to worry about their names when we get home. Jonathan has developed a technique for his 3D videos of approaching the plant with the camera skimming the grass and low vegetation and slowly rising as he approaches the plant. Although we are all on the same trip, I’m sure that we’ll end up with three quite different presentations. 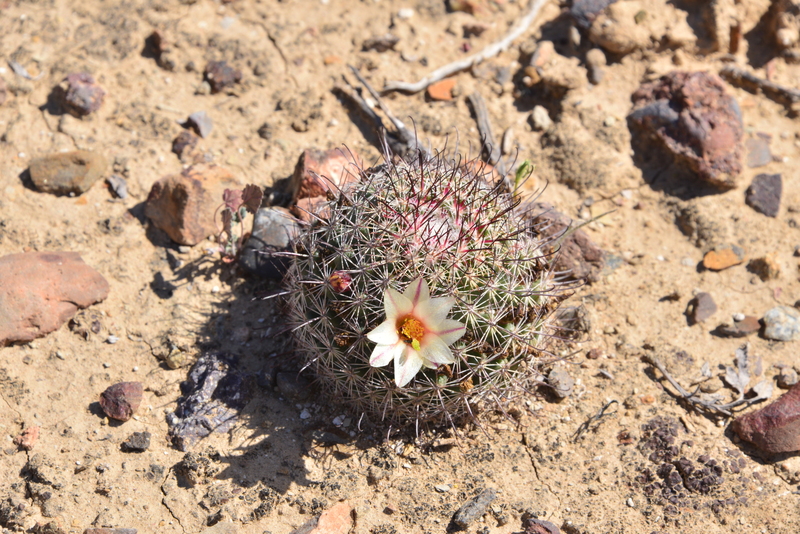 We are also finding numerous Mammillaria of the M. dioica complex. We’re a but later in the season than usual, so I might be lucky and spot some of the named flower colour variations on a theme – fingers crossed. The Catavina boulder fields always provide a scenic settings for cacti and succulents, so we’re adding many hundreds of images to the already overflowing image database back home!